08-02-2019 - We would like to inform you that strikes are announced in Belgium for Wednesday 13 February 2019. 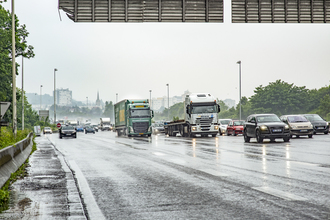 15-11-2018 - There will be a strike taking place on Saturday 17 November in France due to the increase of the fuel price. 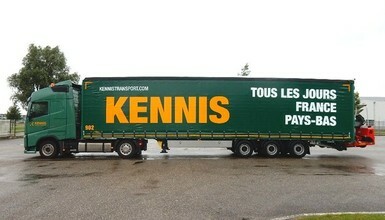 01-05-2018 - We are very pleased to announce some changes within the Kennis Transport Group. 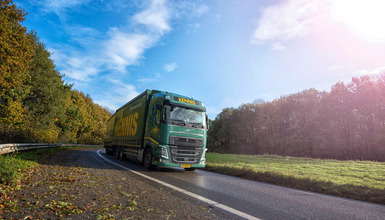 Starting May 1, 2018 Kennis Transport & Logistics B.V. and ELEM B.V. (part of the Kennis Group since 2014) will merge and all activities will be concentrated at Kennis Transport & Logistics B.V.
03-07-2015 - This week Bluekens truck and Bus has delivered us for further expansion 2 new Volvo FH Euro 6 tractors. These tractors are build on low deck chassis to get more internal height in the Trailers. 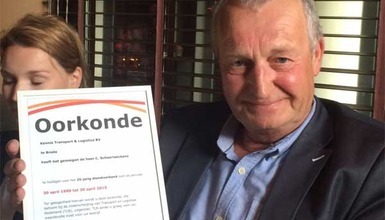 11-05-2015 - On the 30th of April our highly valued employee Cor Schaerlaeckens worked for 25 years in the company.